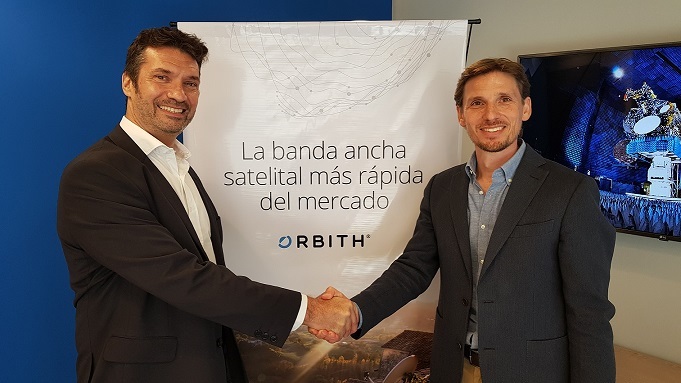 Orbith selected Newtec to guarantee this throughput optimization using the Newtec Dialog(R) VSAT platform, including different application modems that support single carrier operation of up to 500 MHz and the latest satellite transmission standard, DVB-S2X, to maximize space segment usage. This marks the first time the Satcom industry has seen a single 450 MHz carrier over a wideband transponder for commercial use. Operating via the Newtec Dialog XIF HUB, Orbith is deploying two types of Newtec\-\-s remote terminals, which consist of a modem and an outdoor unit set. The easy-to-use, high-performance Newtec MDM2210 IP Satellite Modems are being used for Orbith\-\-s broadband customers, including consumer and SME networks. This modem features an embedded Wi-Fi-router, allowing end-users to easily add numerous devices to the same connection, and delivers throughputs of more than 100 Mbit/s. Corporate users connected to the network use the MDM3310 Satellite Modem, which enables the support of various bandwidth-hungry applications in a cost-effective way. Newtec ensures this with its award-winning bandwidth allocation technology, Mx-DMA(R), delivering the efficiency of SCPC with the dynamism of TDMA. This means the bandwidth can be changed and adapted on-demand, giving more control and increased efficiency while making it easy to shift capacity to each site as required, delivering a reliable service to Orbith\-\-s customers. Newtec Dialog enables the multiservice concept, allowing all modems to be managed from the single platform, making Orbith\-\-s operations scalable, flexible and future-proof.